This article is about the role-playing game. For other uses, see Dungeons & Dragons (disambiguation) and D&D (disambiguation). Dungeons & Dragons (commonly abbreviated as D&D) is a fantasy tabletop role-playing game (RPG) originally designed by Gary Gygax and Dave Arneson. It was first published in 1974 by Tactical Studies Rules, Inc. (TSR). The game has been published by Wizards of the Coast (now a subsidiary of Hasbro) since 1997. It was derived from miniature wargames, with a variation of the 1971 game Chainmail serving as the initial rule system. D&D's publication is commonly recognized as the beginning of modern role-playing games and the role-playing game industry. D&D departs from traditional wargaming by allowing each player to create their own character to play instead of a military formation. These characters embark upon imaginary adventures within a fantasy setting. A Dungeon Master (DM) serves as the game's referee and storyteller, while maintaining the setting in which the adventures occur, and playing the role of the inhabitants of the game world. The characters form a party and they interact with the setting's inhabitants and each other. Together they solve dilemmas, engage in battles, and gather treasure and knowledge. In the process, the characters earn experience points (XP) in order to rise in levels, and become increasingly powerful over a series of separate gaming sessions. The early success of D&D led to a proliferation of similar game systems. Despite the competition, D&D has remained as the market leader in the role-playing game industry. In 1977, the game was split into two branches: the relatively rules-light game system of basic Dungeons & Dragons, and the more structured, rules-heavy game system of Advanced Dungeons & Dragons (abbreviated as AD&D). AD&D 2nd Edition was published in 1989. In 2000, a new system was released as D&D 3rd edition, continuing the edition numbering from AD&D; a revised version 3.5 was released in June 2003. These 3rd edition rules formed the basis of the d20 System, which is available under the Open Game License (OGL) for use by other publishers. D&D 4th edition was released in June 2008. The 5th edition of D&D, the most recent, was released during the second half of 2014. As of 2004[update], D&D remained the best-known, and best-selling, role-playing game, with an estimated 20 million people having played the game, and more than US$1 billion in book and equipment sales. The game has been supplemented by many pre-made adventures, as well as commercial campaign settings suitable for use by regular gaming groups. D&D is known beyond the game itself for other D&D-branded products, references in popular culture, and some of the controversies that have surrounded it, particularly a moral panic in the 1980s falsely linking it to Satanism and suicide. The game has won multiple awards and has been translated into many languages. An elaborate D&D game in progress. Among the gaming aids here are dice, a variety of miniatures and a dungeon diorama. The results of the party's choices and the overall storyline for the game are determined by the Dungeon Master (DM) according to the rules of the game and the DM's interpretation of those rules. The DM selects and describes the various non-player characters (NPCs) that the party encounters, the settings in which these interactions occur, and the outcomes of those encounters based on the players' choices and actions. Encounters often take the form of battles with "monsters" – a generic term used in D&D to describe potentially hostile beings such as animals, aberrant beings, or mythical creatures. The game's extensive rules – which cover diverse subjects such as social interactions, magic use, combat, and the effect of the environment on PCs – help the DM to make these decisions. The DM may choose to deviate from the published rules or make up new ones if they feel it is necessary. D&D uses polyhedral dice to resolve in-game events. These are abbreviated by a 'd' followed by the number of sides. Shown counter-clockwise from the bottom are: d4, d6, d8, d10, d12 and d20 dice. A pair of d10 can be used together to represent percentile dice, or d100. A typical Dungeons & Dragons game consists of an "adventure", which is roughly equivalent to a single story. The DM can either design an original adventure, or follow one of the many pre-made adventures (also known as "modules") that have been published throughout the history of Dungeons & Dragons. Published adventures typically include a background story, illustrations, maps and goals for PCs to achieve. Some include location descriptions and handouts. Although a small adventure entitled "Temple of the Frog" was included in the Blackmoor rules supplement in 1975, the first stand-alone D&D module published by TSR was 1978's Steading of the Hill Giant Chief, written by Gygax. Dungeons & Dragons miniature figures. The grid mat underneath uses one-inch squares. The wargames from which Dungeons & Dragons evolved used miniature figures to represent combatants. D&D initially continued the use of miniatures in a fashion similar to its direct precursors. The original D&D set of 1974 required the use of the Chainmail miniatures game for combat resolution. By the publication of the 1977 game editions, combat was mostly resolved verbally. Thus miniatures were no longer required for game play, although some players continued to use them as a visual reference. 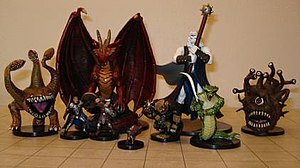 In the 1970s, numerous companies began to sell miniature figures specifically for Dungeons & Dragons and similar games. Licensed miniature manufacturers who produced official figures include Grenadier Miniatures (1980–1983), Citadel Miniatures (1984–1986), Ral Partha, and TSR itself. Most of these miniatures used the 25 mm scale. Periodically, Dungeons & Dragons has returned to its wargaming roots with supplementary rules systems for miniatures-based wargaming. Supplements such as Battlesystem (1985 & 1989) and a new edition of Chainmail (2001) provided rule systems to handle battles between armies by using miniatures. Dungeons & Dragons has gone through several revisions. Parallel versions and inconsistent naming practices can make it difficult to distinguish between the different editions. The original Dungeons & Dragons set. The original Dungeons & Dragons, now referred to as OD&D, was a small box set of three booklets published in 1974. It was amateurish in production and assumed the player was familiar with wargaming. Nevertheless, it grew rapidly in popularity, first among wargamers and then expanding to a more general audience of college and high school students. Roughly 1,000 copies of the game were sold in the first year followed by 3,000 in 1975, and much more in the following years. This first set went through many printings and was supplemented with several official additions, such as the original Greyhawk and Blackmoor supplements (both 1975), as well as magazine articles in TSR's official publications and many fanzines. First edition Advanced Dungeons & Dragons Dungeon Masters Guide. In early 1977, TSR created the first element of a two-pronged strategy that would divide D&D for nearly two decades. A Dungeons & Dragons Basic Set boxed edition was introduced that cleaned up the presentation of the essential rules, made the system understandable to the general public, and was sold in a package that could be stocked in toy stores. Later in 1977, the first part of Advanced Dungeons & Dragons (AD&D) was published, which brought together the various published rules, options and corrections, then expanded them into a definitive, unified game for hobbyist gamers. TSR marketed them as an introductory game for new players and a more complex game for experienced ones; the Basic Set directed players who exhausted the possibilities of that game to switch to the advanced rules. As a result of this parallel development, the basic game included many rules and concepts which contradicted comparable ones in AD&D. John Eric Holmes, the editor of the basic game, preferred a lighter tone with more room for personal improvisation. AD&D, on the other hand, was designed to create a tighter, more structured game system than the loose framework of the original game. Between 1977 and 1979, three hardcover rulebooks, commonly referred to as the "core rulebooks", were released: the Player's Handbook (PHB), the Dungeon Master's Guide (DMG), and the Monster Manual (MM). Several supplementary books were published throughout the 1980s, notably Unearthed Arcana (1985) that included a large number of new rules. Confusing matters further, the original D&D boxed set remained in publication until 1979, since it remained a healthy seller for TSR. In the 1980s, the rules for Advanced Dungeons & Dragons and "basic" Dungeons & Dragons remained separate, each developing along different paths. In 1981, the basic version of Dungeons & Dragons was revised by Tom Moldvay to make it even more novice-friendly. It was promoted as a continuation of the original D&D tone, whereas AD&D was promoted as advancement of the mechanics. An accompanying Expert Set, originally written by David "Zeb" Cook, allowed players to continue using the simpler ruleset beyond the early levels of play. In 1983, revisions of those sets by Frank Mentzer were released, revising the presentation of the rules to a more tutorial format. These were followed by Companion (1983), Master (1985), and Immortals (1986) sets. Each set covered game play for more powerful characters than the previous. The first four sets were compiled in 1991 as a single hardcover book, the Dungeons & Dragons Rules Cyclopedia, which was released alongside a new introductory boxed set. Advanced Dungeons & Dragons 2nd Edition was published in 1989, again as three core rulebooks; the primary designer was David "Zeb" Cook. The Monster Manual was replaced by the Monstrous Compendium, a loose-leaf binder that was subsequently replaced by the hardcover Monstrous Manual in 1993. In 1995, the core rulebooks were slightly revised, although still referred to by TSR as the 2nd Edition, and a series of Player's Option manuals were released as optional rulebooks. The release of AD&D 2nd Edition deliberately excluded some aspects of the game that had attracted negative publicity. References to demons and devils, sexually suggestive artwork, and playable, evil-aligned character types – such as assassins and half-orcs – were removed. The edition moved away from a theme of 1960s and 1970s "sword and sorcery" fantasy fiction to a mixture of medieval history and mythology. The rules underwent minor changes, including the addition of non-weapon proficiencies – skill-like abilities that originally appeared in 1st Edition supplements. The game's magic spells were divided into schools and spheres. A major difference was the promotion of various game settings beyond that of traditional fantasy. This included blending fantasy with other genres, such as horror (Ravenloft), science fiction (Spelljammer), and apocalyptic (Dark Sun), as well as alternative historical and non-European mythological settings. In 1997, a near-bankrupt TSR was purchased by Wizards of the Coast. Following three years of development, Dungeons & Dragons 3rd edition was released in 2000. The new release folded the Basic and Advanced lines back into a single unified game. It was the largest revision of the D&D rules to date, and served as the basis for a multi-genre role-playing system designed around 20-sided dice, called the d20 System. The 3rd Edition rules were designed to be internally consistent and less restrictive than previous editions of the game, allowing players more flexibility to create the characters they wanted to play. Skills and feats were introduced into the core rules to encourage further customization of characters. The new rules standardized the mechanics of action resolution and combat. In 2003, Dungeons & Dragons v.3.5 was released as a revision of the 3rd Edition rules. This release incorporated hundreds of rule changes, mostly minor, and expanded the core rulebooks. In early 2005, Wizards of the Coast's R&D team started to develop Dungeons & Dragons 4th Edition, prompted mainly by the feedback obtained from the D&D playing community and a desire to make the game faster, more intuitive, and with a better play experience than under the 3rd Edition. The new game was developed through a number of design phases spanning from May 2005 until its release. Dungeons & Dragons 4th Edition was announced at Gen Con in August 2007, and the initial three core books were released June 6, 2008. 4th Edition streamlined the game into a simplified form and introduced numerous rules changes. Many character abilities were restructured into "Powers". These altered the spell-using classes by adding abilities that could be used at will, per encounter, or per day. Likewise, non-magic-using classes were provided with parallel sets of options. Software tools, including player character and monster building programs, became a major part of the game. On January 9, 2012, Wizards of the Coast announced that it was working on a 5th edition of the game. The company planned to take suggestions from players and let them playtest the rules. Public playtesting began on May 24, 2012. At Gen Con 2012 in August, Mike Mearls, lead developer for 5th Edition, said that Wizards of the Coast had received feedback from more than 75,000 playtesters, but that the entire development process would take two years, adding, "I can't emphasize this enough ... we're very serious about taking the time we need to get this right." The release of the 5th Edition, coinciding with D&D's 40th anniversary, occurred in the second half of 2014. The game had more than three million players around the world by 1981, and copies of the rules were selling at a rate of about 750,000 per year by 1984. Beginning with a French language edition in 1982, Dungeons & Dragons has been translated into many languages beyond the original English. By 2004, consumers had spent more than US$1 billion on Dungeons & Dragons products and the game had been played by more than 20 million people. As many as six million people played the game in 2007. The various editions of Dungeons & Dragons have won many Origins Awards, including All Time Best Roleplaying Rules of 1977, Best Roleplaying Rules of 1989, and Best Roleplaying Game of 2000 for the three flagship editions of the game. Both Dungeons & Dragons and Advanced Dungeons & Dragons are Origins Hall of Fame Games inductees as they were deemed sufficiently distinct to merit separate inclusion on different occasions. The independent Games magazine placed Dungeons & Dragons on their Games 100 list from 1980 through 1983, then entered the game into the magazine's Hall of Fame in 1984. Advanced Dungeons & Dragons was ranked 2nd in the 1996 reader poll of Arcane magazine to determine the 50 most popular roleplaying games of all time. Eric Goldberg reviewed Dungeons & Dragons in Ares Magazine #1, rating it a 6 out of 9. Goldberg commented that "Dungeons and Dragons is an impressive achievement based on the concept alone, and also must be credited with cementing the marriage between the fantasy genre and gaming." Dungeons & Dragons was the first modern role-playing game and it established many of the conventions that have dominated the genre. Particularly notable are the use of dice as a game mechanic, character record sheets, use of numerical attributes and gamemaster-centered group dynamics. Within months of Dungeons & Dragons's release, new role-playing game writers and publishers began releasing their own role-playing games, with most of these being in the fantasy genre. Some of the earliest other role-playing games inspired by D&D include Tunnels & Trolls (1975), Empire of the Petal Throne (1975), and Chivalry & Sorcery (1976). The role-playing movement initiated by D&D would lead to release of the science fiction game Traveller (1977), the fantasy game RuneQuest (1978), and subsequent game systems such as Chaosium's Call of Cthulhu (1981), Champions (1982), GURPS (1986), and Vampire: The Masquerade (1991). Dungeons & Dragons and the games it influenced fed back into the genre's origin – miniatures wargames – with combat strategy games like Warhammer Fantasy Battles. D&D also had a large impact on modern video games. Director Jon Favreau credits Dungeons & Dragons with giving him "... a really strong background in imagination, storytelling, understanding how to create tone and a sense of balance." Early in the game's history, TSR took no action against small publishers' production of D&D compatible material, and even licensed Judges Guild to produce D&D materials for several years, such as City State of the Invincible Overlord. This attitude changed in the mid-1980s when TSR took legal action to try to prevent others from publishing compatible material. This angered many fans and led to resentment by the other gaming companies. Although TSR took legal action against several publishers in an attempt to restrict third-party usage, it never brought any court cases to completion, instead settling out of court in every instance. TSR itself ran afoul of intellectual property law in several cases. With the launch of Dungeons & Dragons's 3rd Edition, Wizards of the Coast made the d20 System available under the Open Game License (OGL) and d20 System trademark license. Under these licenses, authors were free to use the d20 System when writing games and game supplements. The OGL and d20 Trademark License made possible new games, some based on licensed products like Star Wars, and new versions of older games, such as Call of Cthulhu. With the release of the fourth edition, Wizards of the Coast introduced its Game System License, which represented a significant restriction compared to the very open policies embodied by the OGL. In part as a response to this, some publishers (such as Paizo Publishing with its Pathfinder Roleplaying Game) who previously produced materials in support of the D&D product line, decided to continue supporting the 3rd Edition rules, thereby competing directly with Wizards of the Coast. Others, such as Kenzer & Company, are returning to the practice of publishing unlicensed supplements and arguing that copyright law does not allow Wizards of the Coast to restrict third-party usage. During the 2000s, there has been a trend towards reviving and recreating older editions of D&D, known as the Old School Revival. Game systems based on earlier editions of D&D. Castles & Crusades (2004), by Troll Lord Games, is a reimagining of early editions by streamlining rules from OGL. This in turn inspired the creation of "retro-clones", games which more closely recreate the original rule sets, using material placed under the OGL along with non-copyrightable mechanical aspects of the older rules to create a new presentation of the games. Alongside the publication of the fifth edition, Wizards of the Coast established a two-pronged licensing approach. The core of the fifth edition rules have been made available under the OGL, while publishers and independent creators have also been given the opportunity to create licensed materials directly for Dungeons & Dragons and associated properties like the Forgotten Realms under a program called the DM's Guild. The DM's Guild does not function under the OGL, but uses a community agreement intended to foster liberal cooperation among content creators. At various times in its history, Dungeons & Dragons has received negative publicity, in particular from some Christian groups, for alleged promotion of such practices as devil worship, witchcraft, suicide, and murder, and for the presence of naked breasts in drawings of female humanoids in the original AD&D manuals (mainly monsters such as harpies, succubi, etc.). These controversies led TSR to remove many potentially controversial references and artwork when releasing the 2nd Edition of AD&D. Many of these references, including the use of the names "devils" and "demons", were reintroduced in the 3rd edition. The moral panic over the game led to problems for fans of D&D who faced social ostracism, unfair treatment, and false association with the occult and Satanism, regardless of an individual fan's actual religious affiliation and beliefs. Dungeons & Dragons has been the subject of rumors regarding players having difficulty separating fantasy from reality, even leading to psychotic episodes. The most notable of these was the saga of James Dallas Egbert III, the facts of which were fictionalized in the novel Mazes and Monsters and later made into a TV movie in 1982 starring Tom Hanks. The game was blamed for some of the actions of Chris Pritchard, who was convicted in 1990 of murdering his stepfather. Research by various psychologists, starting with Armando Simon, has concluded that no harmful effects are related to the playing of D&D. The game's commercial success was a factor that led to lawsuits regarding distribution of royalties between original creators Gygax and Arneson. Gygax later became embroiled in a political struggle for control of TSR which culminated in a court battle and Gygax's decision to sell his ownership interest in the company in 1985. Dungeons & Dragons has, however, been cited as encouraging people to socialize weekly or biweekly, teaching problem solving skills which can be beneficial in adult life, and teaching positive moral decisions. D&D's commercial success has led to many other related products, including Dragon Magazine, Dungeon Magazine, an animated television series, a film series, an official role-playing soundtrack, novels, and numerous computer and video games. Hobby and toy stores sell dice, miniatures, adventures, and other game aids related to D&D and its game offspring. D&D grew in popularity through the late 1970s and 1980s. Numerous games, films, and cultural references based on D&D or D&D-like fantasies, characters or adventures have been ubiquitous since the end of the 1970s. D&D players are (sometimes pejoratively) portrayed as the epitome of geekdom, and have become the basis of much geek and gamer humor and satire. Famous D&D players include Pulitzer Prize winning author Junot Díaz, professional basketball player Tim Duncan, comedian Stephen Colbert, and actors Vin Diesel and Robin Williams. D&D and its fans have been the subject of spoof films, including Fear of Girls and The Gamers: Dorkness Rising. ^ a b "D&D Basic Set". Rulebooks and Sets. acaeum.com. Archived from the original on June 24, 2011. Retrieved May 16, 2013. ^ "Frankly, the difference in sales between Wizards and all other producers of roleplaying games is so staggering that even saying there is an 'RPG industry' at all may be generous." Cook; "The Open Game License as I see it". ^ a b c Gygax; "From the Sorcerer's Scroll" in The Dragon #26. ^ a b Slavicsek; Ampersand: Exciting News! ^ Johnson, et al. ; 30 Years of Adventure, p. 253. ^ "Dungeons & Dragons Enters a Pivotal Year with Tyranny of Dragons". Wizards.com. May 19, 2014. Archived from the original on May 21, 2014. Retrieved May 20, 2013. ^ a b Waters; What happened to Dungeons and Dragons? ^ McMartin Preschool: Anatomy of a Panic - Retro Report. The New York Times. Retrieved July 31, 2018. ^ Bethke, Erik (2003). Game development and production. Wordware Game Developer's Library. Wordware Publishing, Inc. p. 12. ISBN 1-55622-951-8. ^ a b c Williams, Hendricks & Winkler 2006 "The Role-Playing Game and the Game of Role-Playing"
^ Spade, Joan Z.; Ballantine, Jeanne H. (2011). "Meso-Level Agents of Gender Socialization". Schools and Society: A Sociological Approach to Education (4 ed.). Pine Forge Press. p. 294. ISBN 1-4129-7924-2. ^ Rouchart & Aylett 2003, p. 245. ^ Rouchart & Aylett 2003, p. 245–46. ^ Rouchart & Aylett 2003, p. 246. ^ Wizards of the Coast; What is D&D? ^ The original game used 3d6 in the order rolled (Gygax, Arneson; Dungeons & Dragons). Variants have since been included (Gygax; Dungeon Masters Guide, p. 11) and the standard for 3rd edition is "rolling four six-sided dice, ignoring the lowest die, and totaling the other three" (Tweet, Cook, Williams; Player's Handbook [3.0], p. 4), arranging the results in any order desired. 4th edition allows for a "point buy" system. ^ "Generally, when you are subject to an unusual or magical attack, you get a saving throw to avoid or reduce the effect." There is identical language in sections titled 'Saving Throws' in (Tweet 2000:119). ^ "Gary Gygax - Creator of Dungeons & Dragons". TheOneRing. Archived from the original on December 6, 2013. Retrieved January 10, 2014. ^ Carroll, Bart; Winter, Steve (February 6, 2009). "Name Level". Dragon (372). Wizards of the Coast. Archived from the original on April 15, 2012. ^ Peterson, Jon (2012). Playing at the World. Unreason. p. 496. ISBN 978-0-615-64204-8. ^ "Basic set". Acaeum.com. Archived from the original on June 24, 2011. ^ "This is not AD&D 3rd edition" Winter, Steven (in the forward to Cook; Player's Handbook). ^ Appelcline, Shannon (August 3, 2006). "Wizards of the Coast: 1990 – present". A Brief History of Game. RPGnet. Archived from the original on August 24, 2006. Retrieved September 1, 2006. ^ "After ... the idea of acquiring TSR began to swim in my mind it took me maybe thirty seconds to decide, We've got to do a third edition of Dungeons & Dragons." (Adkison, Peter in Johnson, et al. ; 30 Years of Adventure, p. 250). ^ Harnish, MJ (January 9, 2012). "5th Edition D&D Is in Development — Should We Care?". Wired. Archived from the original on May 31, 2014. Retrieved January 9, 2012. ^ Gilsdorf, Ethan (January 9, 2012). "Players Roll the Dice for Dungeons & Dragons Remake". The New York Times. p. 2. Archived from the original on January 10, 2012. Retrieved January 9, 2012. ^ Mearls, Mike (January 9, 2012). "Charting the Course for D&D: Your Voice, Your Game". Wizards of the Coast. Archived from the original on December 25, 2012. Retrieved January 9, 2012. ^ Ewalt, David M. (August 20, 2012). "What's Next With Dungeons And Dragons?". Forbes. Archived from the original on August 25, 2012. Retrieved August 26, 2012. ^ Frum, Larry (May 19, 2014). "40 years later, 'Dungeons & Dragons' still inspiring gamers". CNN. Archived from the original on February 14, 2018. Retrieved February 13, 2018. ^ Stewart Alsop II (February 1, 1982). "TSR Hobbies Mixes Fact and Fantasy". ^ "Origins Award Winners (1996)". Academy of Adventure Gaming Arts & Design. Archived from the original on December 21, 2007. Retrieved November 2, 2007. ^ a b Goldberg, Eric (March 1980). "A Galaxy of Games". Ares Magazine. Simulations Publications, Inc. (1): 33. ^ "Although we have come a long way since D&D, the essential concept is still the same, and is one that will endure." (Darlington; "A History of Role-Playing Part IX"). ^ Sacco, Ciro Alessandro. "The Ultimate Interview with Gary Gygax". thekyngdoms.com. Archived from the original on January 31, 2012. Retrieved September 2, 2014. ^ Appelcline, Shannon (July 16, 2008). "Games & The Law, Part Seven: The D&D Dilemma". Archived from the original on May 4, 2009. Retrieved July 7, 2009. ^ Anonymous (July 9, 2008). "Kenzer & Co, D&D, and Trademarks". Robertson Games. Archived from the original on January 18, 2010. Retrieved July 7, 2009. ^ a b Montgomery, Jeff. "Ownership and License (OGL) Questions". Dungeon Masters Guild. Archived from the original on February 15, 2018. Retrieved February 13, 2018. ^ a b Cardwell; "The Attacks on Role-Playing Games"
^ Adams,, Aubrey S. (2013). ""Needs Met Through Role-Playing Games: A Fantasy Theme Analysis of Dungeons & Dragons."". Kaleidoscope: A Graduate Journal of Qualitative Communication Research. 12. ^ Wright, Jennifer Cole (2017). ""Imaginative Role-Playing as a Medium for Moral Development."". Journal of Humanistic Psychology. ^ Manson, Marilyn; Strauss, Neil (1999). The Long Hard Road Out of Hell. HarperCollins. p. 26. ISBN 0-06-098746-4. ^ Lees, Jennie. "Fear of Girls". Joystiq. Archived from the original on October 27, 2011. ^ Haberman, Clyde. "When Dungeons & Dragons Set Off a 'Moral Panic'". The New York Times. Archived from the original on April 18, 2016. Retrieved April 18, 2016. Allston, Aaron (1992). Wrath of the Immortals. TSR. ISBN 1-56076-412-0. Appelcline, Shannon (2006). "Chaosium: 1975–present". A Brief History of Game. RPGnet. Retrieved August 13, 2007. Arneson, Dave (June – July 1979). "My Life and Role Playing". Different Worlds #3. Chaosium: 6–9. Bledsaw, Bob (July 1979). "From the Sorcerer's Scroll: What has Judges Guild done for Dungeons and Dragons". The Dragon #27. TSR Hobbies. IV (1): 10–11. Boucher, Geoff (May 5, 2008). "Jon Favreau is the action figure behind 'Iron Man'". Los Angeles Times. Los Angeles Times. Archived from the original on May 17, 2008. Retrieved May 17, 2008. Briggs, Jerry (November 30, 1997). "Duncan's unusual hobby and more unusual request". San Antonio Express-News (Texas). Cardwell, Paul, Jr. (1994). "The Attacks on Role-Playing Games". Skeptical Inquirer. 18 (2): 157–165. Retrieved August 4, 2007. Carter, Michele; et al. (2007). Wizards Presents Races and Classes. Wizards of the Coast. ISBN 978-0-7869-4801-7. Cohen, David X.; Keeler, Ken; Rogers, Eric (writers) (May 5, 2005). Futurama, Anthology of Interest I (Television production). 20th Century Fox Television. Cook, Monte; Williams, Skip; Tweet, Jonathan (2003) . Dungeon Master's Guide v.3.5. revised by David Noonan, Rich Redman. Wizards of the Coast. ISBN 0-7869-2889-1. Cook, Monte. "The Open Game License as I See It, Part II". montecook.com. Archived from the original on April 17, 2007. Retrieved March 15, 2007. Currell, Latasha (September 1, 2004). "Dungeons and Dragons—30 Years and Going Strong". The Golden Gate [X]Press Online. The Journalism Department @ San Francisco State University. Archived from the original on November 4, 2004. Retrieved April 3, 2007. Dancey, Ryan (February 7, 2000). "Adventure Game Industry Market Research Summary (RPGs)". V1.0. Wizards of the Coast. Retrieved February 23, 2007. Darlington, Steven (August 1998). "A History of Role-Playing Part IV: Part Four: Hell and High Finance". Places to Go, People to Be (4). Retrieved April 3, 2007. Darlington, Steven (November 1998). "A History of Role-Playing Part V: The Power and the Glory". Places to Go, People to Be. Places to Go, People to Be (5). Retrieved February 28, 2007. Darlington, Steven (June 1999). "A History of Role-Playing Part VIII: Dark Times". Places to Go, People to Be. Places to Go, People to Be (8). Retrieved February 28, 2007. Darlington, Steven (August 1999). "A History of Role-Playing Part IX: The End and The Beginning". Places to Go, People to Be. Places to Go, People to Be (9). Retrieved April 3, 2007. Drout, Michael D. C. (2007). J.R.R. Tolkien Encyclopedia: Scholarship and Critical Assessment. New York: Routledge. ISBN 978-0-415-96942-0. Cook, David (1989b). Player's Handbook. TSR. ISBN 0-88038-716-5. Cook, David (1995) [1989b]. Player's Handbook (Revised ed.). TSR. ISBN 0-7869-0329-5. DeVarque, Aardy R. "Literary Sources of D&D". Rec.games.frp.dnd FAQs. Archived from the original on July 21, 2007. Retrieved February 21, 2007. Fine, Gary Alan (2002). Shared Fantasy: Role Playing Games as Social Worlds. New York: University of Chicago Press. ISBN 0-226-24944-1. Gagne, Kenneth A. (April 27, 2001). "Moral Panics Over Youth Culture and Video Games". Worcester Polytechnic Institute. Retrieved August 27, 2007. Grady, RJ (August 4, 2004). "In Genre: THE DUNGEON". RPGnet. Retrieved April 5, 2007. Grigg, Robert (June 16–20, 2005). "Albert Goes Narrative Contracting". DiGRA 2005 Papers. Vancouver, British Columbia, Canada: Simon Fraser University. Retrieved August 12, 2007. Gygax, Gary (1979). Dungeon Masters Guide. TSR. ISBN 0-935696-02-4. Gygax, Gary (April 1976). "The Dungeons and Dragons Magic System". The Strategic Review. TSR Hobbies. II (2). Gygax, Gary; Arneson, Dave (1974). Dungeons & Dragons (3-Volume Set). TSR. Gygax, Gary (December 1978). "Dungeons & Dragons: What Is It and Where Is It Going?". The Dragon #21. TSR. III (8): 29–30. ISSN 1062-2101. Gygax, Gary (June 1979). "From the Sorcerer's Scroll: D&D, AD&D and Gaming". The Dragon #26. TSR Hobbies. III (12): 28–30. ISSN 1062-2101. Gygax, Gary. "Gygax FAQ". The Creative World of Gary Gygax. Archived from the original on January 28, 1999. Retrieved July 4, 2006. Gygax, Gary (1977). Monster Manual. TSR. ISBN 0-935696-00-8. Gygax, Gary (March 1985). "On the influence of J.R.R. Tolkien on the D&D and AD&D games". Dragon #95. TSR Hobbies, Inc. IX (10): 12–13. ISSN 0279-6848. Gygax, Gary (1978). Player's Handbook. TSR. ISBN 0-935696-01-6. Hallford, N.; Hallford, J. (2001). Swords & Circuitry: A Designer's Guide to Computer Role Playing Games (1st ed.). Thomson Course Technology PTR. p. 39. ISBN 0-7615-3299-4. Hately, Shaun (February 1999). "The Disappearance of James Dallas Egbert III (Part I)". Places to Go, People to Be (6). Retrieved February 21, 2007. Heinsoo, Rob; Collins, Andy; Wyatt, James (2008). Player's Handbook. Wizards of the Coast. ISBN 978-0-7869-4867-3. Hite, Kenneth (March 30, 2006). "State of the Industry 2005: Another Such Victory Will Destroy Us". GamingReport.com. Archived from the original on February 4, 2009. Retrieved February 21, 2007. Johnson, Harold; et al. (2004). 30 Years of Adventure: A Celebration of Dungeons & Dragons. Wizards of the Coast. ISBN 0-7869-3498-0. Kuntz, Rob (April 1978). "Tolkien in Dungeons & Dragons". The Dragon #13. TSR Hobbies, Inc. II (7). Kushner, David (March 10, 2008). "Dungeon Master: The Life and Legacy of Gary Gygax". Wired.com. Archived from the original on November 13, 2012. Retrieved October 16, 2008. Leckart, Steven (June 26, 2007). "Ratatouille Star Patton Oswalt on Geeks vs. Nerds". Wired. 15 (7). McCuen, Mike (2002). "15mm Battlesystem Paladin 1994". Small Obsessions. Archived from the original on June 8, 2007. Retrieved March 17, 2007. Mead, Lawrence; Malcomson, Ian (2003). "Dungeons & Dragons FAQ". Wizards of the Coast. Retrieved October 3, 2008. Mentzer, Frank (1984). Dungeons & Dragons (Set 3: Companion Rules). TSR. ISBN 0-88038-340-2. Mentzer, Frank (1986). Dungeons & Dragons (Set 5: Immortal Rules). TSR. ISBN 0-88038-341-0. Mohan, Kim (1986). Wilderness Survival Guide. TSR. ISBN 0-88038-291-0. Moore, Jeff. "15mm Scale Fantasy Figures". Humberside Wargames Society. Archived from the original on April 6, 2007. Retrieved March 17, 2007. Mythmere. "Castles & Crusades Players Handbook (4.6 stars)". Mythmere's Wondrous Resource. Retrieved March 19, 2007. O'Connor, John (December 28, 1982). "TV: 'Mazes and Monsters,' Fantasy". The New York Times. Retrieved August 4, 2007. Pope, Thomas (March 25, 2004). "Grenadier Models, Advanced Dungeons and Dragons". The Stuff of Legends. Retrieved February 21, 2007. Pope, Thomas (February 27, 2000). "Ral Partha". The Stuff of Legends. Retrieved February 28, 2007. Pope, Thomas (November 5, 1999). "TSR". The Stuff of Legends. Retrieved February 28, 2007. Pramas, Chris (July 14, 2008). "Green Ronin and Fourth Edition D&D". Green Ronin. Retrieved November 20, 2008. Pryor, Tony; Herring, Tony; Tweet, Jonathan; Richie, Norm (1993). Creative Campaigning. TSR. ISBN 1-56076-561-5. Rausch, Allen (August 19, 2004). "Dave Arneson Interview". GameSpy. Retrieved February 23, 2007. Rilstone, Andrew (1994). "Role-Playing Games: An Overview". The Oracle. Archived from the original on August 23, 2000. Retrieved April 4, 2007. Schend, Steven E.; Pickens, Jon; Warty, Dori, eds. (1991). Rules Cyclopedia. TSR. ISBN 1-56076-085-0. Schick, Lawrence (1991). Heroic Worlds: A History and Guide to Role-Playing Games. Amherst, New York: Prometheus Books. ISBN 0-87975-653-5. Scott, Richard. "Otherworld, The Citadel AD&D Miniatures Range". Otherworld Miniatures. Retrieved February 21, 2007. Shanafelt, Steve (November 2, 2005). "The growing chic of geek: How turning 30 made Dungeons & Dragons feel young again". Mountain Xpress. 12 (14). Retrieved August 4, 2007. Simon, Armando (October 1987). "Emotional Stability Pertaining to Dungeons and Dragons". Psychology in the Schools. 24 (4): 329–332. doi:10.1002/1520-6807(198710)24:4<329::AID-PITS2310240406>3.0.CO;2-9. Slavicsek, Bill (October 19, 2007). "Ampersand: Exciting News!". Wizards of the Coast. Archived from the original on June 19, 2009. Retrieved October 22, 2007. Slavicsek, Bill; Sernett, Matthew (2006). Dungeons & Dragons Basic Game. Wizards of the Coast. ISBN 0-7869-3944-3. Slavicsek, Bill; Baker, Richard (2005). Dungeons & Dragons for Dummies. Wiley Publishing. ISBN 0-7645-8459-6. Svensson, Peter (July 21, 2008). "Dungeons & Dragons reborn". Associated Press. Archived from the original on August 22, 2008. Retrieved November 17, 2008. Svitavsky, William (June 2001). "Geek Culture: An Annotated Interdisciplinary Bibliography". The Bulletin of Bibliography. 58 (2): 101–108. Archived from the original on April 14, 2013. Retrieved November 25, 2008. Thorn, Mike (June 9, 2006). "Review of Hackmaster 4th Edition". RPGnet. Retrieved March 19, 2007. Tonjes, Wayne (October 19, 2005). "Interview with Charles Ryan on the 2005 Worldwide Dungeons & Dragons Game Day". Gaming Report. Archived from the original on February 21, 2009. Retrieved August 4, 2007. Tweet, Jonathan (2004). Dungeons & Dragons Basic Game. Wizards of the Coast. ISBN 0-7869-3409-3. Tweet, Jonathan; Cook, Monte; Williams, Skip (2000). Player's Handbook. Wizards of the Coast. ISBN 0-7869-1550-1. Tweet, Jonathan; Cook, Monte; Williams, Skip (2003) . Player's Handbook v.3.5. revised by Collins, Andy. Wizards of the Coast. ISBN 0-7869-2886-7. Tweet, Jonathan (May 20, 2004). "What Are D&D Miniatures?". Wizards of the Coast. Retrieved February 28, 2007. Waldron, David (Spring 2005). "Role-Playing Games and the Christian Right: Community Formation in Response to a Moral Panic". Journal of Religion and Popular Culture. Department of Religious Studies and Anthropology, The University of Saskatchewan. IX. Archived from the original on February 4, 2012. Retrieved February 27, 2007. Ward, James M. (February 1990). "The Games Wizards: Angry Mothers From Heck (And what we do about them)". Dragon Magazine #154. XIV (9): 9. ISSN 0279-6848. Waskul, Dennis; Lust, Matt (2004). "Role-Playing and Playing Roles: The Person, Player, and Persona in Fantasy Role-Playing" (PDF). Caliber. 27 (3): 222–256. doi:10.1525/si.2004.27.3.333. Archived from the original (PDF) on December 4, 2012. Retrieved December 23, 2008. Waters, Darren (April 26, 2004). "What happened to Dungeons and Dragons?". BBC News Online. Retrieved February 21, 2007. Williams, J. P.; Hendricks, S. Q.; Winkler, W. K. (2006). Williams, J. Patrick; Hendricks, Sean Q.; Winkler, W. Keith (eds.). Gaming as Culture, Essays on Reality, Identity and Experience in Fantasy Games. McFarland & Company: Oxford University Press. ISBN 0-7864-2436-2. Williams, Skip (1995). Dungeon Master Option: High Level Campaigns. TSR. ISBN 0-7869-0168-3. Williams, Skip; Tweet, Jonathan; Cook, Monte (2000). Monster Manual. Wizards of the Coast. ISBN 0-7869-1552-8. "Archive of List of Origins Award Winners". Academy of Adventure Gaming Arts and Design. 2006. Archived from the original on January 25, 2007. Retrieved February 22, 2007. – select year on right of page. "Hall of Fame". Academy of Adventure Gaming Arts and Design. 2006. Archived from the original on June 26, 2007. Retrieved July 6, 2007. "List of Winners". Academy of Adventure Gaming Arts & Design. 2001. Archived from the original on August 30, 2007. Retrieved September 1, 2007. "Hall of Fame". Games Magazine Online. 2007. Archived from the original on August 12, 2007. Retrieved August 13, 2007. "Dungeon Crawl Classics". Goodman Games. Archived from the original on March 24, 2007. Retrieved March 20, 2007. "D20 Products with 3rd Edition Rules, 1st Edition Feel". Necromancer Games. 2007. Archived from the original on August 7, 2007. Retrieved August 21, 2007. "Paizo Publishing Announces the Pathfinder RPG". Paizo Publishing. March 18, 2008. Archived from the original on December 6, 2008. Retrieved November 21, 2008. "How Dungeon & Dragons shaped the modern videogame". PC Gamer. Future Publishing Limited. February 8, 2007. Retrieved April 3, 2007. "The d20 System". Wizards of the Coast. Retrieved August 14, 2007. "Dungeons & Dragons Flashes 4-ward at Gen Con" (PDF). Wizards of the Coast. August 16, 2007. Retrieved August 19, 2007. "The History of TSR". Wizards of the Coast. Archived from the original on October 4, 2008. Retrieved August 20, 2005. "What Is D&D?". Wizards of the Coast. Retrieved February 21, 2007. "Wizards of the Coast at Gen Con!". Wizards of the Coast. 2007. Retrieved August 18, 2007. "Mike Myers". Inside the Actors' Studio. Season 7. Episode 9. February 4, 2001. "Countdown to 3rd Edition: Feats and Fighters". Dragon #270. Wizards of the Coast. XXIV (11): 30–31. April 2000. ISSN 1062-2101. "Interview with Dave Arneson". Pegasus. Judges Guild (1). April – May 1981. Archived from the original on March 21, 2009. Retrieved February 23, 2007. Rouchart, Sandy; Aylett, Ruth (2003). Rist, Thomas (ed.). Solving the Narrative Paradox in VEs — Lessons from RPGs. Intelligent Virtual Agents: 4th International Workshop. Springer. ISBN 978-3-540-20003-1. Barrowcliffe, Mark (2008). The Elfish Gene: Dungeons, Dragons and Growing Up Strange. Soho Press. ISBN 978-1-56947-601-7. Bebergal, Peter (November 15, 2004). "How 'Dungeons' Changed the World". The Boston Globe. The New York Times Company. Retrieved January 4, 2008. Edwards, Ron. "A Hard Look at Dungeons and Dragons". The Forge. Retrieved February 23, 2007. An essay on the early history of the D&D hobby. Ewalt, David M. (2013). Of Dice and Men: The Story of Dungeons & Dragons and the People Who Play It. New York: Scribner. ISBN 978-1-4516-4050-2. OCLC 800031925. Includes a suggested reading list on pages 255–256. Garfield, Richard (2007). "Dungeons & Dragons". In Lowder, James (ed.). Hobby Games: The 100 Best. Green Ronin Publishing. pp. 86–89. ISBN 978-1-932442-96-0. Gilsdorf, Ethan (2009). Fantasy Freaks and Gaming Geeks. Lyons Press. ISBN 978-1-59921-480-1. Gygax, Gary. Roleplaying Mastery. New York: Perigee, 1987. ISBN 0-399-51293-4. Gygax, Gary. Master of the Game. New York: Perigee, 1989. ISBN 0-399-51533-X. Miller, John J. "I Was a Teenage Half-Orc", National Review Online, October 15, 2004. Miller, John J. "Dungeons & Dragons In a Digital World", The Wall Street Journal, July 1, 2008. Mitchell-Smith, Ilan (June 16, 2009). "Chapter 11: Racial Determinism in the Interlocking Economies of Power and Violence in Dungeons & Dragons". In Carley, Robert (ed.). Coopting Culture. Lexington/Rowman & Littlefield Books. pp. 207–224. ISBN 978-0739125977. Mona, Erik. "From the Basement to the Basic Set: The Early Years of Dungeons & Dragons". The MIT Press. Retrieved May 6, 2009. Peterson, Jon. Playing at the World: A History of Simulating Wars, People and Fantastic Adventures, from Chess to Role-Playing Games. San Diego: Unreason, 2012. ISBN 978-0-615-64204-8. Pulsipher, Lew (1983). "Introduction to Dungeons & Dragons, Parts I–V". The Best of White Dwarf. Games Workshop (Articles Volume II): 10–18. Slavicsek, Bill; Baker, Richard (2006). Dungeon Master for Dummies. Wiley Publishing. ISBN 0-471-78330-7. Wagner, James (March 29, 2000). "Opening the dungeon". Salon. Archived from the original on March 12, 2005. An article about the conflict over the proprietary or open-source nature of Dungeons & Dragons. Off Book (June 20, 2013). "Dungeons & Dragons and the Influence of Tabletop RPGs". PBS.